Blasts from the past and present: altmetrics. The NMR spectra of methanoannulene and its dianion. The diatropic/paratropic inversion. Normally, such electrons in a σ framework are considered to be more stable than in a p-π-framework,‡ because the s-character of the former does not have a node at the nucleus and hence the electrons are bound more strongly. In this case however, the transformation from anti-aromaticity to aromaticity provides more than enough stabilisation through resonance for the σ-to-π promotion to occur. So here I ask a different question to that posed on the aforementioned blog or article; could you achieve the same result using ten electrons rather than six? On the left of the diagram above for the 10-case, we have a planar 8-ring with 8 p-π-electrons and two carbene electrons. 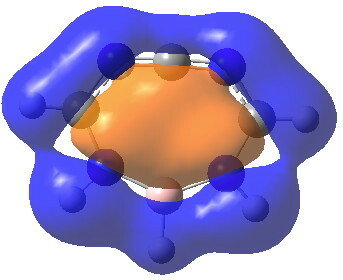 Promoting the latter would produce a 10π-aromatic ring (for another example of such, see here). Indeed so! 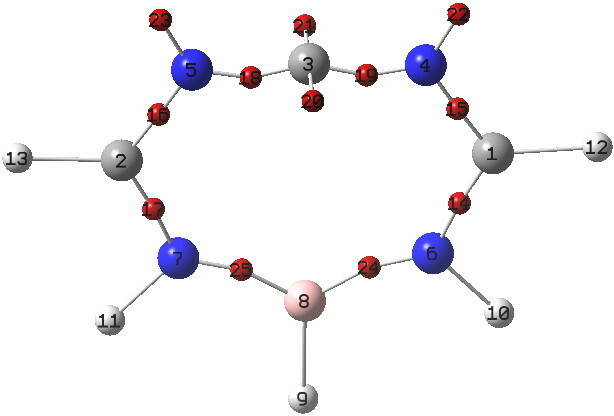 This 10π-system has five occupied π-MOs, a low energy delocalised σ-MO of interest (below; is it σ-aromatic?) and a LUMO corresponding to the vacated carbene orbital. ELF analysis (below) also reveals no carbene lone pair (basins 20 and 21 have 0.44e each, and 18/19 2.70 each, giving that central carbon 6.28e, resembling the vinyl carbocation shown above in resonance). Not all is rosy however. This species is in fact not a stable minimum, but a transition state interconverting two buckled (and hence non-aromatic) conformations. It seems that the additional angular ring strain induced by an 8-membered ring has pushed it over the edge from aromatic royalty to non-aromatic commoness (remember this?). But that apart, we can see that 10 electrons can behave similarly to six in inducing a two-electron promotion from a carbene lone pair. Not quite homoaromaticity; I think it should be given its own named aromatic type! Any suggestions? ‡That is certainly largely true of carbon. But much less true for the more electropositive boron. Thus it is not unusual to find such promotions occurring for planar boron frameworks. This entry was posted on Sunday, October 20th, 2013 at 3:57 pm and is filed under Interesting chemistry. You can follow any responses to this entry through the RSS 2.0 feed. You can leave a response, or trackback from your own site. Six vs ten aromatic electrons? is licensed by Henry Rzepa under a Creative Commons Attribution-Noncommercial-Share Alike 3.0 United States License.